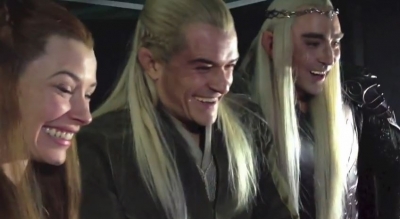 Legolas - Fan Reaction Desolation Smaug Trailer. With Tauriel and Thranduil. Wallpaper and background images in the Legolas Greenleaf club tagged: the hobbit legolas greenleaf elf prince. This Legolas Greenleaf photo might contain portrait, headshot, and closeup.